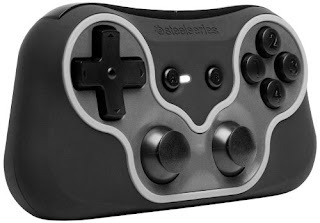 The SteelSeries Free Mobile Gaming Controller is a wireless Bluetooth controller designed for cross-platform use on PC/Mac, Android smartphones and tablets, iPod touch, iPhone and iPad. This new breed of gaming controller brings together a compact and lightweight design with the industry's best cross-platform capability. Add in a classic, familiar layout and a rechargeable battery with 20 hours of casual playtime and you have the freedom to play. SteelSeries Free Mobile Gaming Controller SteelSeries Free Mobile Gaming Controller Full support for Android and iOS platform games SteelSeries Free Mobile Gaming Controller PC and Mac titles that are controller enabled are also compatible with the SteelSeries Free. Consumer entertainment is evolving. TV is watched on computers, games are played on tablets, and music is listened to on phones. Entertainment doesn't stop at just one platform, it moves from the desk to the couch to a backpack, purse and pocket. With the Mobile Gaming Controller, SteelSeries introduces the freedom to play. Every way, everywhere.